My late cousin was an amateur actor. He once told me that the two absolute basics were “remember your lines” and “don’t bump into the furniture”. In motor racing the equivalents are “to finish first, you first have to finish” and “don’t crash into your team-mate”. As I write this, the failure to obey these two maxims are responsible for this website’s preferred drivers lying in 2nd and 5th in the championship table. The Singapore disaster of the Ocon/Perez impersonation team was well reported by my fellow reporter Jack, so I will concentrate on the first maxim. During the 3rd practice session Seb suffered a problem, so a rapid engine change took place. The engine failed again during Q1, reports indicating a broken manifold between the turbo and the engine or “IC Unit”. In the race, Kimi didn’t even make the starting grid. As usual, his comments were succinct, sensible and positive. “It’s disappointing but there’s nobody to blame. It’s one of those things.” Isn’t that so much better than the sour faced championship leader constantly complaining to his engineers who already put him where he is? Who would you sooner work with? Sergio Marchionne, meanwhile, blamed the issue on the current team being “comparatively young and finding its way” after last year’s restructuring. Really? These aren’t apprentices from the local job centre. They’re the top people in the industry and in any event the leadership doesn’t decide to get a manifold from B&Q rather than the proper supplier, there are experienced groups in the business, most of whom won’t have changed significantly in the last few years. I suggest the finger points at the ridiculous engine rules. I cannot imagine anybody denying that Ferrari and for that matter Honda are, as corporations, superb engine designers. If two Ferrari engines fail and Honda are consistently way behind the pack, something is wrong. Complexity for its own sake is just dumb. Engine rules the fans don’t especially understand, care about even less and which have no real relevance to road cars need revoking for something challenging but simpler, relevant and appealing. 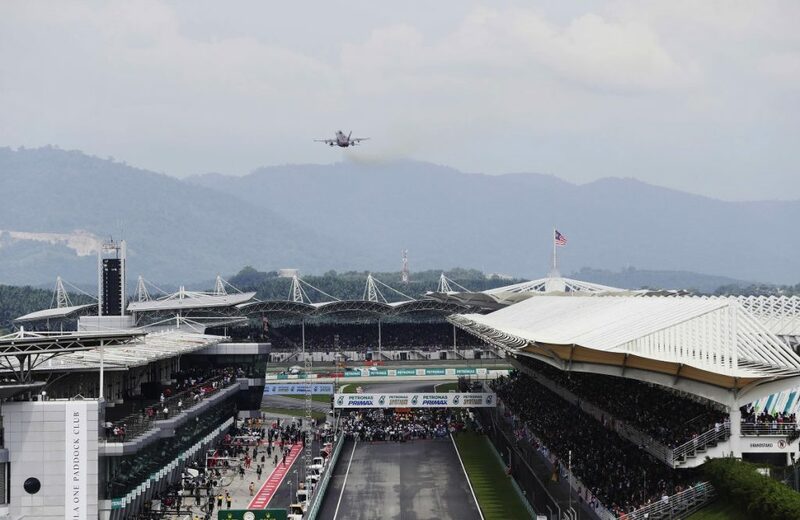 Qualifying got as far as turn 4 before Seb suffered the failure. To be honest, I lost interest after that. Mercedes had made major overnight changes which seemed to suit Hamilton if not Bottas. Hamilton really is the king of “b***s out” qualifying and although Kimi’s SF70-H looked the better car, Hamilton gave it everything for his pole lap. Even he couldn’t match it on his second run, and Kimi did well to be but a tenth behind. If only Seb had been there….The true pace of the Mercedes was shown by Bottas’s 5th, 0.7 seconds slower than his leader. 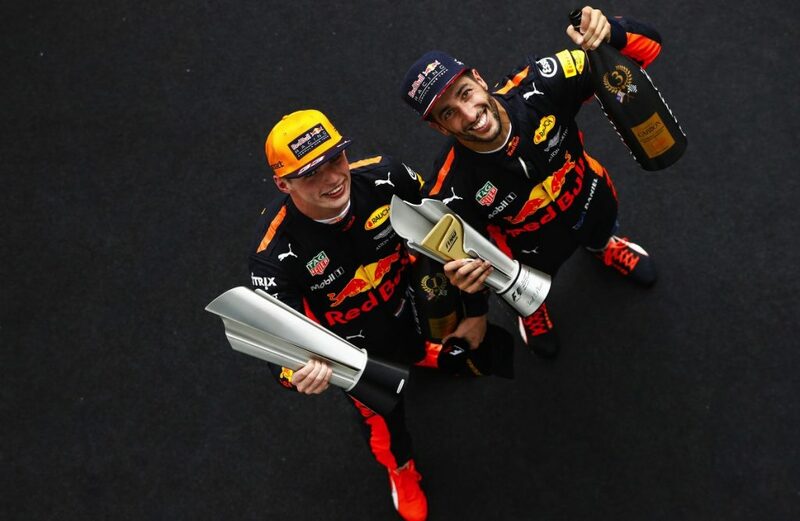 Best of the rest was as usual Max Verstappen, celebrating entering his 3rd decade on Saturday, ahead of Ricciardo while Mercedes’ newer engine in the two Force Indias and a Williams, plus a meritorious Stoffel VanDoorne finished the top 10. The mediocre and regularly grumpy Kyvat was booted out in favour of Red Bull junior driver Pierre Gasly who was only just behind Sainz. Credit to RB for their conveyor belt of talent. I dreamt of a close race between Kimi and Hamilton, while Seb gamely battled through to a well-deserved second. Reality dawned as the grid formed. Kimi was pushed into the garage and the team made itself busy staring. The engines are too complex to do anything. 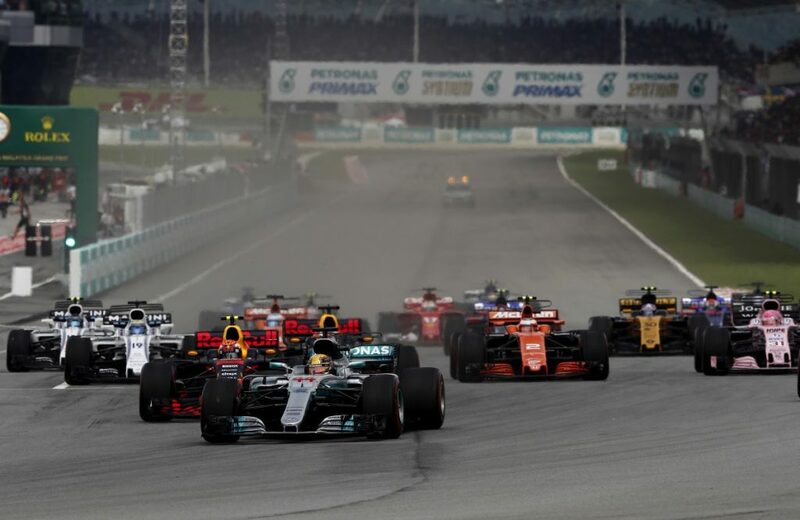 At the start, Bottas showed as much controlled aggression in moving up to third as he had lacked in qualifying, while Seb made up about 3 places by the first corner. Reports say he was fuelled a shade light, which would have helped performance and presumably gambled on a safety car. There was generally a lot of first lap bustling resulting in a puncture for Ocon and a damaged floor for Massa. Unusually with this pair, it looked to be racing incidents. By the end of lap 1, Seb was in P13, and P11 by lap 3 at which point he had reached Alonso who showed all the co-operation one would expect. None. It was 6 laps later when he got past. Meanwhile, Verstappen showed that there’s a big difference between qualifying and race pace and after a brief defence against Bottas, he sliced past Hamilton for the lead on lap 4. 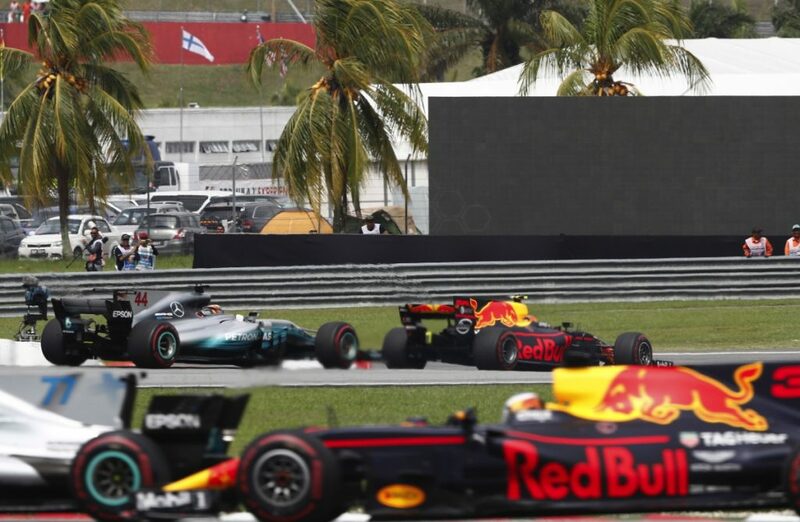 The inferiority of the Mercedes to the Red Bulls was emphasised as Ricciardo took third from Bottas on lap 9 in a clean but close will-he-won’t-he dice. I don’t want to infer that this end of the race order was boring, but Verstappen, Hamilton, Ricciardo is how it stayed to the end. But there was Seb to watch. Seb’s fight continued, Massa being the next target, taken when he pitted. Stroll and Vandoorne were passed in the same way. When Stroll returned, there was some interesting if messy looking action as he joined Massa from the rear. Then Vandoorne joined in from the pits, and got ahead. I’m just wondering if Maccas have jumped ship to Renault at the wrong time. How do you spell schadenfreude? And what odds can I get for TR ahead of McLaren in 2018? Perez was initially harder work for Seb. He was about 7 seconds behind and caught up by a second a lap. On lap 21 he took Perez in a move up the inside which looked unbelievably easy thanks to DRS. Perez was mature and didn’t resist. He then closed the gap to Bottas. It was a bit like watching a lion stalk a gazelle. By lap 26, he was within a second. An initial attack was repulsed, and then he took a pit stop for supersofts – just him and Grosjean on them for the last stint. It was a further 2 laps before Seb passed when Bottas pitted. The delay had helped Ricciardo and Hamilton build up a buffer. With a series of fastest laps, Seb was tight behind Ricciardo by lap 47. In the process, he lapped novice Gasly, doing a good job on his debut, who was told by the pit “follow Vettel”. Optimistic, I think. 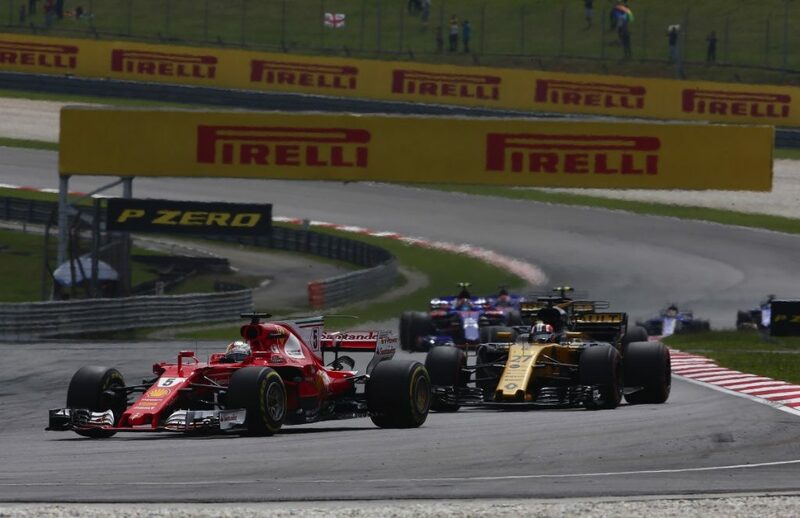 As they all lapped Alonso, he let Ricciardo past, then got out the Big Book of Grudges and waited until a couple of blue flags had been deployed before Seb passed. Seb had a good attempt on Dan on lap 49, but that was it, as the fuel was getting tight and the tyres tired. The top ten was unchanged to the end. It’s unusual to report on the slowing down lap. I wish I didn’t have to. All the drivers weave to try to pick up rubber off-line to add weight and ride height. Seb was weaving as he passed Stroll (which in club racing he would have been penalised for) and he didn’t look in his mirrors (which in club racing he would have been penalised for). As a result, he hit Stroll (which in … you get the idea) and folded up his back wheel. As my cousin would have said, don’t fall off the stage on your curtain call. It was a sad end to a thrilling afternoon with a superb recovery drive, which whilst being very disappointing from a championship point of view made enthralling viewing. If there hadn’t been that engine problem we would be euphoric, and the championship would be close. And that ends Sepang. Despite being a Tilke track it looks to be a fun track to drive with high speed corners and overtaking spots. How long would it take to tow my Dallara behind the Golf out there? It’s given us a few interesting races, but money and markets reign.